False nails. Who here thinks of a coordinating orange tan and hair extensions? Well false nails have moved on a bit since then and they’re actually more accessible and natural looking that I could ever have imagined. 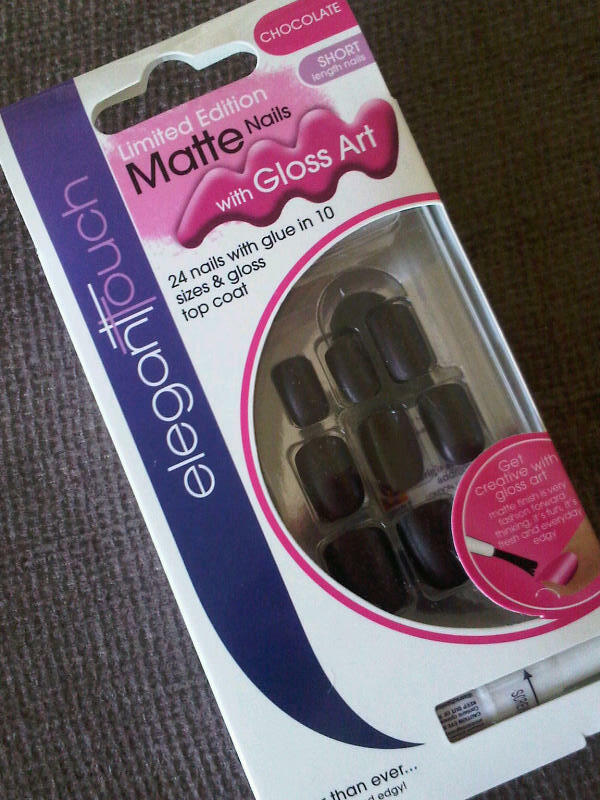 Elegant Touch have added to their extensive collection with their new limited edition Matte Nails with Gloss Art – a two in one product that will have your talons on-trend in no time. 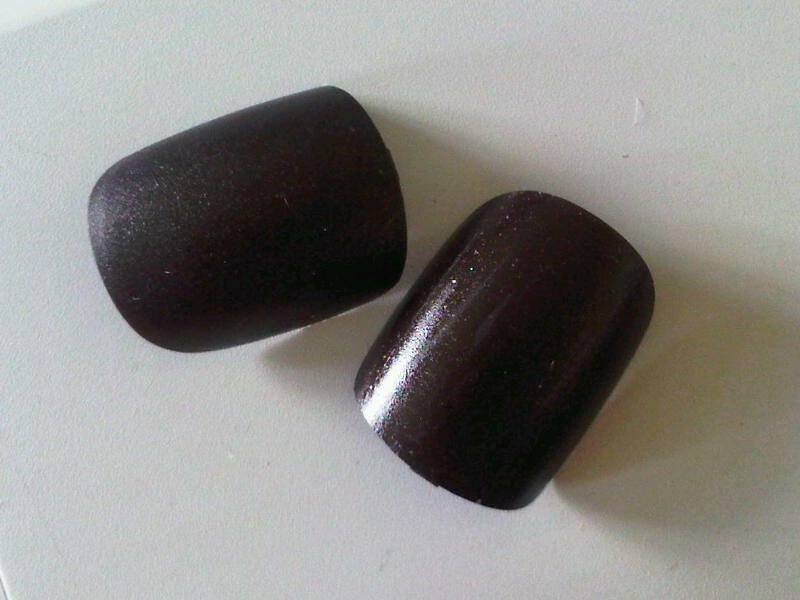 The idea behind the range is that the nails themselves are matte and perfect for a really sophisticated and elegant look. 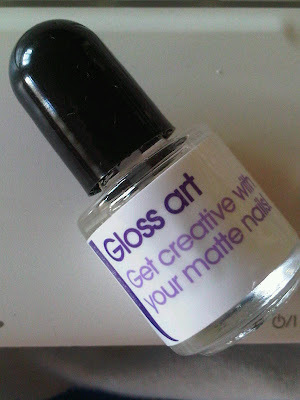 However, if you fancy creating a different look, you can use the Gloss Art polish to create a glossier finish. It gives you the flexibility to change the look and feel of your nails in one simple sweep – or if you don’t like the matte look you can change it in an instant. The nails themselves are really good quality and there’s enough of them (25 different sizes) to ensure there’s a perfect fitting false nail for each of your own. These are in a ‘short’ style so you can get the look without having Paloma Faith-esque length fingers, not having to worry about going to the loo or picking up your phone! The glue is strong, although it’s a good idea to carry it around with you in case of a pinging emergency… you know, when a nail pings off unexpectedly in an embarrassing direction. The Gloss Art polish itself comes in a little bottle that you apply like a top coat. I’m not entirely sure what the difference is between this and an actual top coat, especially as it isn’t great quality and doesn’t make the nail super shiny. I guess it’s the thought (or novelty) that counts though. Here are two of the nails – the one on the left without the Gloss Art polish and the one on the right with. You can see there’s a subtle difference, although it doesn’t make the nail super shiny. You’re supposed to be able to use the brush to draw on different designs, but the brush is chunky so it’s not that easy to do. Personally I prefer the matte look of the nail and I really like the chocolate colour of the sample I was sent. The nails are available in six shades, including purple, blue, red, coral and pink, and the good thing is that the colour goes right through so they won’t chip and leave you with manky looking nails. At £7.10 these aren’t super expensive either, so you can afford to play around. A fun and easy way to update your outfit and cover up those bitten fingers. I feel in love with ur blog, it so flipping cute , great job and get info , please check out mine http://britters89.blogspot.com/ i will be following u .